The sad truth about relationships is that they are rarely ever perfect. A lot of relationships won’t ever have the privilege of seeing itself go all the way because human beings are inherently imperfect, and their imperfections play into the dynamics of the relationship as a whole. There are lots of cases wherein people fall in and out of love with each other throughout the course of a relationship. What people have to understand is that so many conditions and variables have to be perfect in order for a relationship to have a fighting chance. Love alone isn’t enough to sustain a relationship. It takes a lot of commitment, hard work, time, effort, and heaps of good luck. However, there’s no getting around the fact that people fall out of love with each other. It always hurts whenever that happens. You wouldn’t want to wish that kind of emotional pain or trauma unto your worst enemy. It’s a common occurrence, and the best that you can do whenever it happens to you is to just try your best to move on with your life. The earlier you can spot the problems in your relationship, the easier it will be for you to move on from the situation. 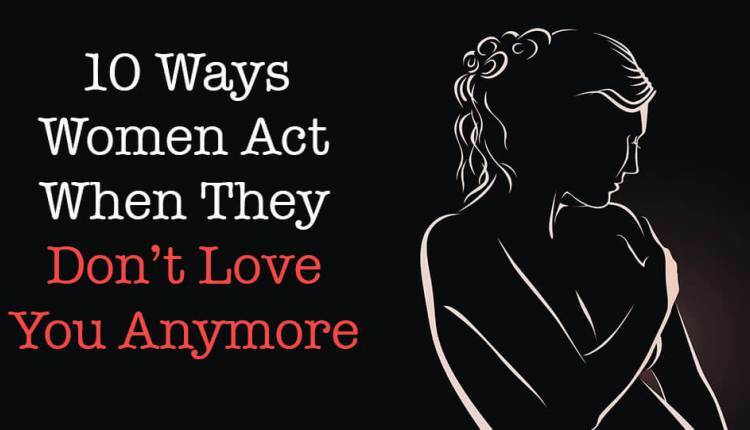 If you can spot early signs of your girlfriend falling out of love with you, then that will bode better for you in the long run. 1. She doesn’t seem like she cares anymore. You feel like there’s no effort there and that her affection for you is slowly dying. It’s as if she’s lost interest in life in general, but in truth, she has only lost interest in you. It’s as if all the vitality and animation that was once in her life has suddenly vanished, and you don’t know what to do about it. 2. She no longer compliments you on your looks. Initially, physical attraction is what brought you together. She used to tell you that you looked so handsome when you first started dating. But overtime, the compliments started to fade away, and now you’re left with practically nothing. She no longer has that physical attraction towards you. You should also check Is Dating a Smart Woman a Problem for Men? 3. She stops putting in the effort to make your relationship work. She sees that your relationship is dying and withering, and she is making no effort whatsoever to save it from a slow and painful death. She couldn’t care less about whether you two fight all the time, and she no longer has the patience to resolve any lingering arguments between the two of you. 4. Communication is rare between the both of you. Communication is always the bedrock of any strong relationship. A couple engaging in open communication with each is always more likely to survive as opposed to couples who shut each other out. When you and your woman no longer have deep and meaningful conversations, then that means she has probably lost interest in you and that your spark is dying. 5. She acts on her own accord regardless of how you feel. Your thoughts and feelings are irrelevant to her. She will do what she wants regardless of how it’s going to make you feel. If her actions end up hurting you in the end, then it really isn’t a problem for her because she doesn’t really love you anymore. 6. She doesn’t express gratitude for your gestures. She used to jump for joy whenever you brought her gifts or flowers. She would get all giddy and excited whenever you would tell her about date plans. She used to plaster a huge smile on her face whenever you came home with food and treats. However, nowadays, your gestures are met with nothing better than indifference. 7. You are always the initiator of conversations. If it always feels like you are the one who is making an effort to initiate conversations, then you should be worried. If she were truly still in love with you, she would also willingly want to talk to you about anything under the sun. She would willingly turn to you for your opinions and your thoughts about things that interest her. 8. She doesn’t make an effort to make you feel special. She used to love doing so many sweet and romantic things for you, however, things have changed. She doesn’t care about making you feel giddy and special anymore. She couldn’t care less about whether or not you were happy in the relationship because obviously, she’s not feeling happy either. 9. She stops asking for your attention, and she stops giving you attention too. In the past, she used to ask for constant communication with you throughout the day. She wanted to always be the apple of your eye, and in turn, she always considered you as the center of her universe. Now though, she barely acknowledges your existence. She also doesn’t ask you to give her your attention anymore because she feels like she no longer needs it. 10. Physical intimacy is a rarity. Kisses. Hugs. Nights in the bedroom. They’re things of the past. When the physical intimacy starts vanishing, you can be assured that your relationship isn’t in a good place.